This specially commissioned map shows the areas covered by the four Fighter Command units that made up Britain’s primary airborne defence in World War II. Fighter Command Groups 10 – 13 flew the new Hurricane and Spitfire planes that had been introduced in the late 1930s, replacing the outmoded biplanes. Opinion was split over whether the fighter plane or the bomber was of primary importance. Air Chief-Marshal Hugh Dowding, Commander-in-Chief of Fighter Command, did not agree. He wanted fighters – the bomber might not get through if only there were enough fighters. Neville Chamberlain had been horrified by Baldwin’s vision of the massed aerial bombing of modern industrial cities, and when he became Prime Minister in 1937, Dowding had a key ally and fighter production was stepped up. But what sort of fighter? In 1938, the Deputy Chief of the Air Staff ordered Dowding to form nine squadrons of Defiants. The newly-designed Boulton-Paul Defiant was a two-seater fighter with a heavy, four-gun turret on top of the fuselage, but no fixed forward-firing armament. But Dowding wanted fast, single-seater fighters with multiple, forward-firing guns. He resisted strong pressure to re-equip Fighter Command with Defiants, and instead equipped his command with Spitfires and Hurricanes. Events were to prove him right. Nine Defiant squadrons were ordered: he formed only two. When the first went into action on the 19 July, seven out of the nine aircraft were lost to German fighter attack. Though the aircraft were the right choice, they couldn’t win the battle alone. The Luftwaffe’s medium bombers could be over London within ten minutes of passing the Kent coast, and even the agile Spitfire took nearly eight minutes to climb to 20,000ft. The RAF needed warning to be able to intercept and destroy the bombers. In the run-up to the war, government scientists stumbled across the ability of radio waves to detect aircraft. Dowding leapt upon the findings, and by 1940 ‘Chain Home’, a network of transmitter-receiver stations, had been built around the south and east coasts. It was this that many argue really won the Battle of Britain. Two levels of radar were used to spot planes at any altitude: the high-level radar was able to track planes above 1000ft, at a typical range of 120m, and the low-level to pick planes up flying at anything down to 500ft. 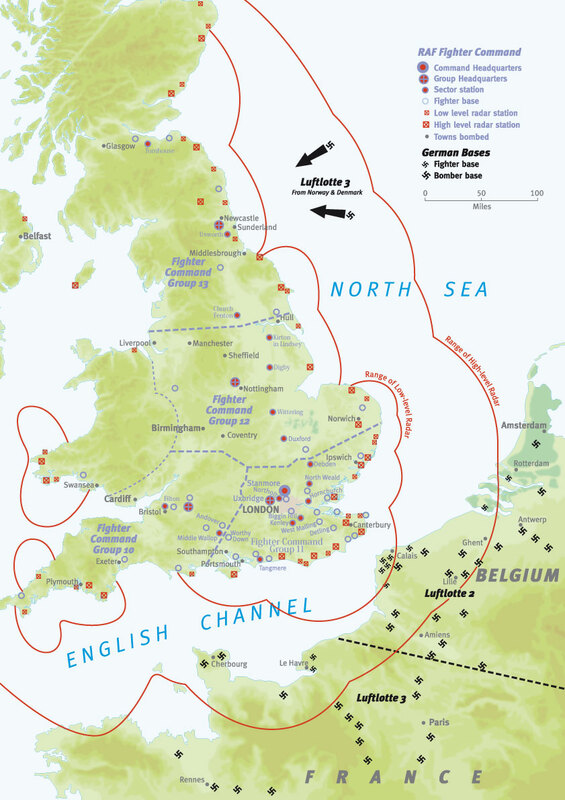 The main phase of the battle took a month, from Eagle Day on 13 August to Battle of Britain Day on 15 September. The Battle was not simply won by the ‘Few’: the pilots were part of a complex system. The RAF numbered 437,000 in October 1940, and not one link, from telephone operators to searchlight crews, could, or did, prove weak. The Defiant was not a bomber, but a fighter with a rear turret. Bombers (at least British bombers) had no relevance in the defensive Battle of Britain. You are right – although the original article that featured in the magazine gave the correct information, it appears this was incorrectly paraphrased when someone uploaded a cut-down section of it to the website, so thank you for flagging this up. We’ve now updated the text here. We actually published a separate article specifically about the Defiant in issue 44 of the magazine, in our ‘Back to the Drawing Board’ section – you can read it in full online here: https://www.military-history.org/back-to-the-drawing-board/the-defiant.htm.